What do you do when your online supermarket sends you a free punnet of blueberries? 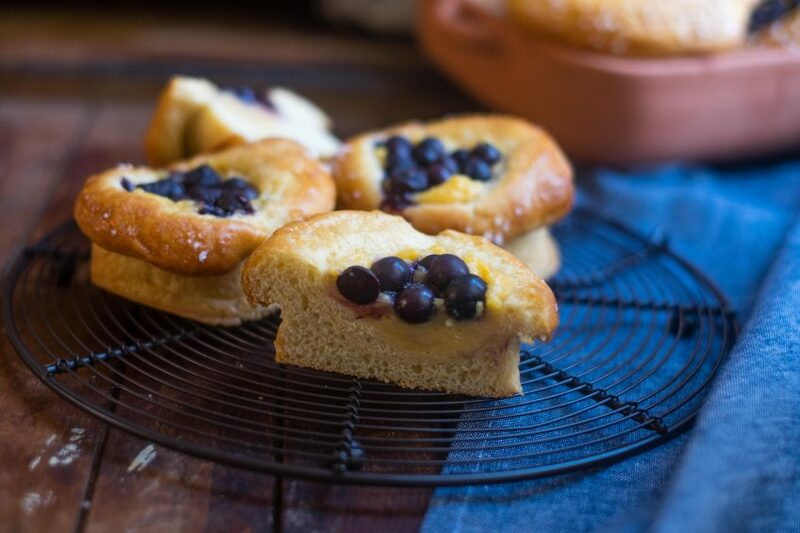 Well you browse through ALL of your patisserie books until you find a recipe you like, that really makes these little berries shine, like these blueberry brioche. 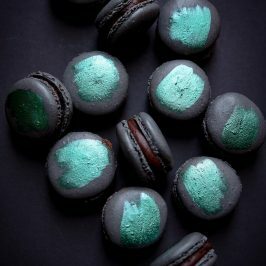 Surprisingly a lot of my books were severely lacking in recipes using blueberries, then I realised I’ve only featured blueberries once before on the blog myself, in these blueberry macarons. I don’t know why I haven’t used them more, they’re so versatile and really tasty. 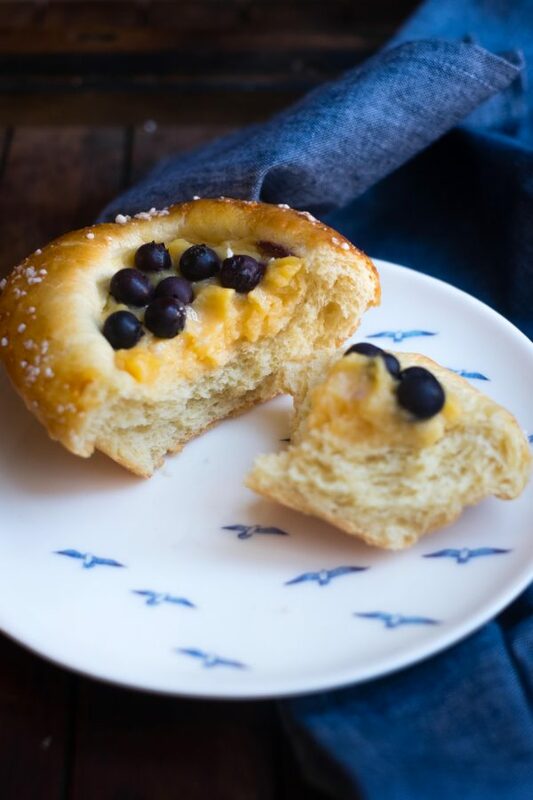 Thankfully Edd Kimber’s book Patisserie Made Simple had this recipe for blueberry brioche. 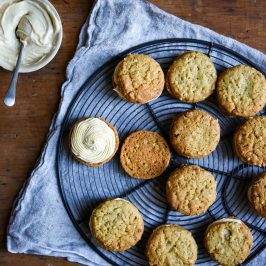 So this is the perfect antidote to any Great British Bake Off blues you might have as it’s a recipe from the first ever winner of the series. I’ve made brioche a few times and had really mixed results, the one thing that has made the biggest difference is my KitchenAid mixer. Using the KitchenAid to do your kneading for you, not only means you can get on with other things, it also does a better job than I could ever do of kneading dough. 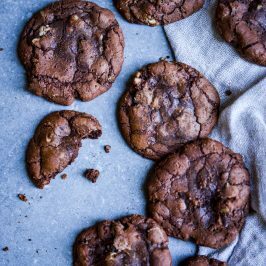 This is not the case for everyone, some people are really good at kneading by hand, but I’m not one of them, so I let my mixer do the work for me, especially if the dough is quite sticky to start with. This is a great breakfast treat from Edd Kimber, the delicious creamy custard topped with sharp blueberries is a really fabulous combination. Put the flours, sugar and salt in the bowl of a food mixer fitted with the dough hook and mix together to combine. Put the milk and yeast in a jug and mix together until the yeast has dissolved. Pour the mixture into the mixer followed by the three eggs. Turn the mixer on to medium and mix until a rough dough is formed. Then continue to knead for a further 10-15 minutes until the dough is smooth and elastic. With the mixer still on, add the butter a couple of pieces at a time, mixing until fully combined. Once all of the butter has been incorporated, knead the dough at a medium-low speed for 10-15 minutes until the dough no longer sticks to the side of the bowl. Put the dough in a large lightly oiled bowl and cover with clingfilm. Place the bowl in the fridge and leave it to rise for 8-10 hours. Next make the creme patissiere so it is cold when you come to use it, put the vanilla extract and milk in a saucepan and bring to the boil. Meanwhile put the egg and yolks in a bowl and add the sugar and cornflour, whisk until pale and smooth. Add the boiling milk to the egg mixture and whisk to combine, pour the mixture back into the saucepan and return to a medium heat, whisking until thickened. Cook for a few minutes extra to remove any taste of cornflour. Pour the custard into a clean bowl, press a piece of clingfilm onto the surface of the creme patissiere and place it in the fridge until needed. When the dough is ready, grease 8 x 10cm tart tins. Remove the dough from the fridge and press gently to knock it back. Divide the dough into 8 individual pieces and form into rounds. Roll or press the round so there are about 11-12cm in diameter. Put the rounds of dough into the prepared tins. 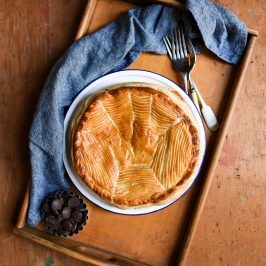 Allow the excess to go up the sides of the tin as if lining it with pastry. This creates a depression in the middle which will later be filled with creme patissiere and blueberries. Cover the rolls with a sheet of lightly oiled clingfilm and leave in a warm place to prove for about two hours until almost doubled in size. Preheat the oven to 180C/160C Fan/Gas 4. To test the dough has proved fully, press it with a lightly floured finger.If the dough springs back slowly it is ready for baking, if it springs back quickly it needs a little more time to prove. Lightly whisk the remaining egg with a teaspoon of water and brush the ridge of the dough, then sprinkle over a little pearl sugar. Fill the depression with a layer of creme patissiere and top with the blueberries. Bake for 20-25mins until the bread is golden brown in colour. Remove from the oven and leave to cool in the tins for 10 minutes, then carefully turn out onto a wire rack to cool completely. 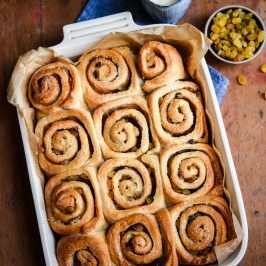 These buns are best on the day they are made, but they can also be frozen for up to one month. 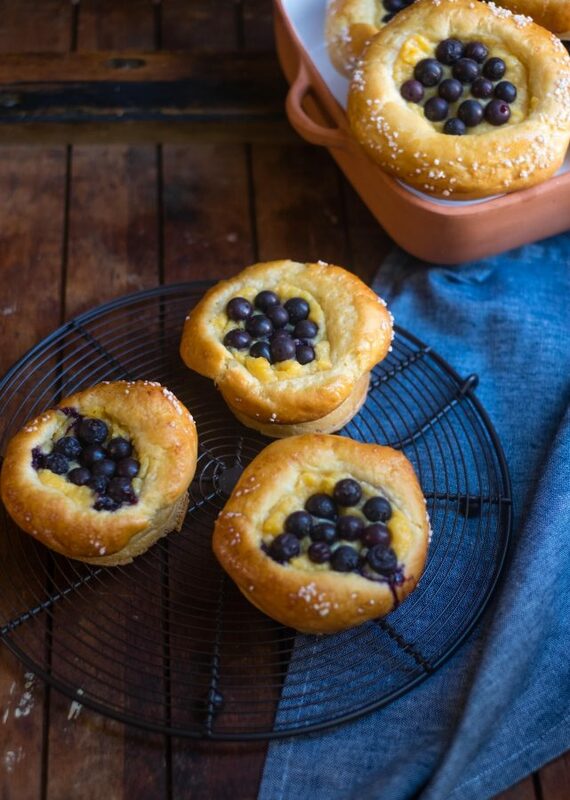 These brioche are filled with a delicious creme patissiere and plump blueberries before baking in the oven. This means the creme patissiere sets to a thick custard and the blueberries are delicious and bursting with flavour. You could easily make these with blackberries or raspberries, or you could even try adding different flavourings to the creme patissiere, coffee, earl grey tea or rose would be delicious, there are so many great combinations. I never really like blueberries all that much until I tried these Jodie – I never realised how sweet they become when they’re baked. They are very expensive here though, is that the same in America? Blueberry pies sound great! Gorgeous little treats! Love the way they look like delicious, soft pillows. Thank you so much Sonali, pillows is the perfect way to describe these. So glad you like them. 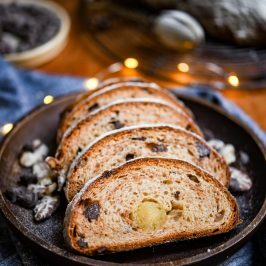 Cheers Lauren – these are really lovely brioche and the recipe is so great because you can substitute different fruits or infuse the creme patissiere with different ingredients. Thank you Ruby! The blueberries are so sweet when they’re baked, it really brings out the vanilla in the creme patissiere. I’m so pleased you like them! 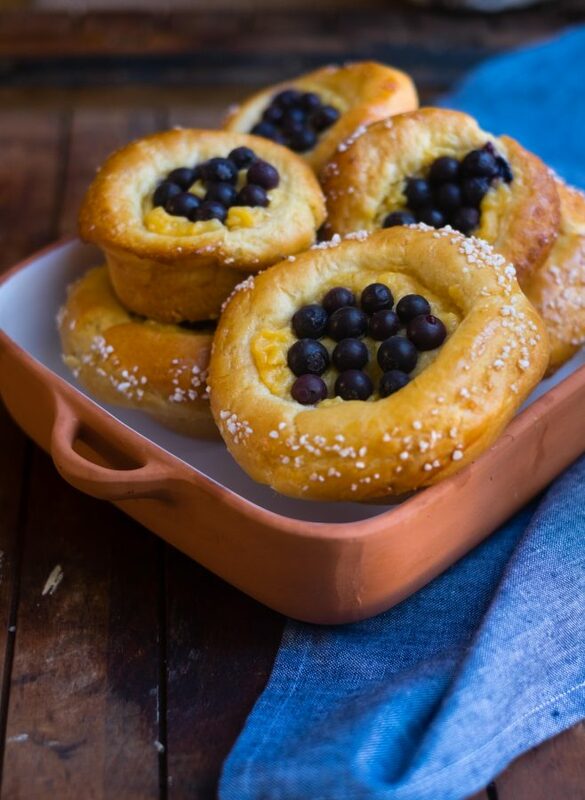 I love the addition of blueberries to the brioche – such a great flavour complement! Thank you Jacquee, this recipe has made me realise how much I like blueberries. They’ve never really been something I’ve cooked with before. I’ve never made brioche! I love to eat it though- this looks fab! I wish I had one of these gorgeous pastries with my coffee this morning! 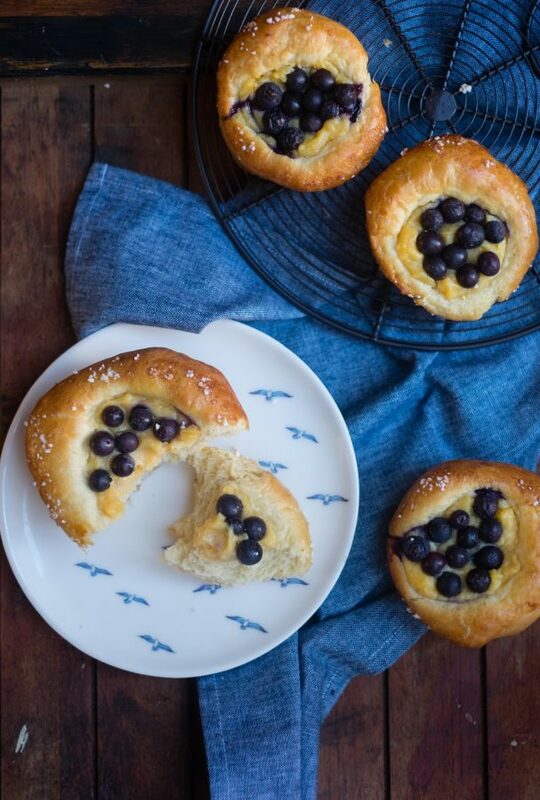 These blueberry brioche are absolutely gorgeous! I love the blueberries piled in the center. Love the styling. 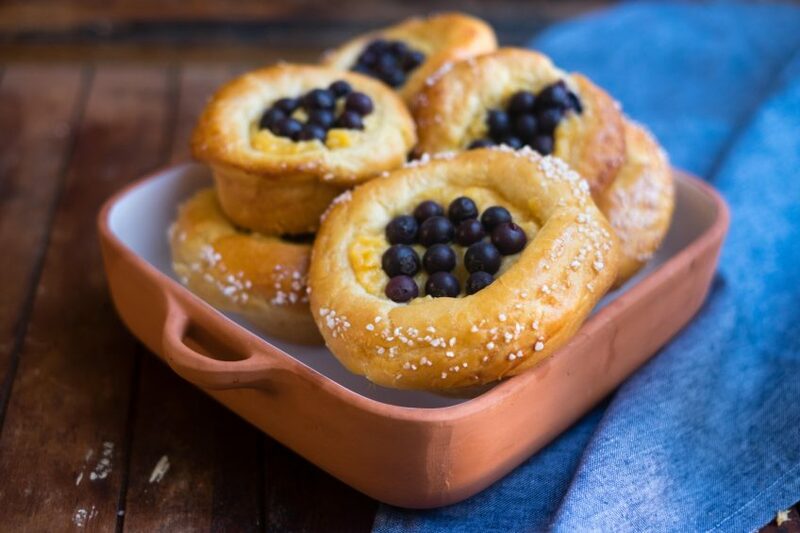 These mini blueberry brioches are so cute and looks delicious!! Thank you so much Ludmilla – they taste so good!